Malta is known for exquisite handiwork, with Maltese lace, clocks, cane work and silverware all highly regarded for their impeccable quality. One art unique to Malta is ganutell, the creation of intricate flowers from wire and beads. Having fallen out of favour in the 20th century, this craft was almost lost – but now a new generation of Maltese women are trying to stop that. Artificial flowers were originally made with materials such as seashells, paper, ribbons and silk. When it arrived in Malta, the art was adapted by combining delicate silver and gold wire with pearls, glass beads and gems. By the 18th century, ganutell (a word derived from the Italian canutiglia) had become a distinctly Maltese art form. A private house in Rabat holds a unique piece of predominantly ganutell art entitled Tree of Life and research shows that the paper roof of a model building within the artwork is that of a music manuscript dating back to the 17th century. In previous centuries, ganutell was practised in monasteries, and the monks’ work can still found in many of the churches around Malta and neighbouring Gozo today. Some churches could not afford to commission or create their own pieces of ganutell, meaning certain ones had to be shared. During World War II, many works of art were destroyed and, up until this point, the craft of ganutell never really regained its prominence. Materials and equipment proved hard to find and expensive to buy, meaning the traditional methods all but died out. Rather than using old-school techniques such as wooden bobbins, people began favouring more modern ones: using pipe cleaners to create shapes, for example, or operating hand-held battery fans to twist inferior-quality wires. For a long time, only people of older generations seemed to be keep up with the ganutell tradition. 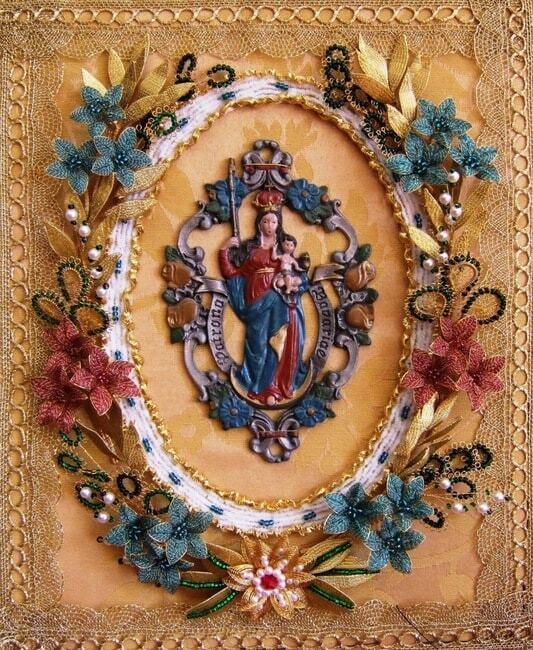 The ladies’ circles found in most Maltese villages, for example, continued to create pieces for churches, particularly at Christmas. But now things are changing. A new generation is beginning to take up the craft, often under the tutelage of the women who have practised the art form all their lives. English expat Sarah Pilbeam Gatt lives in Malta, and she is studying the art of ganutell through a government-run course designed to promote the craft. 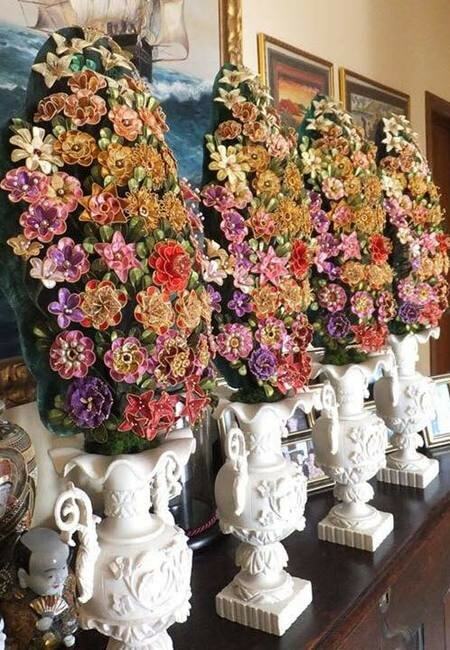 One of the people instrumental in keeping ganutell alive is Maria Kerr, whose book (Ganutell: The Maltese Art of Making Artistic Flowers ) and classes have introduced many newcomers to the craft. Born and raised in the beautiful Maltese village of Lija, Maria designed and embroidered wedding gowns for many years as a housewife and a mother. As Maria’s children began to grow up, she found herself with more time, and took the opportunity to follow her dreams of a career in ganutell making. Maria’s work usually adorns Malta’s churches or homes – but on one occasion her ganutell made it as far as the Parisian runways. ‘My flowers have been used during shows by Japanese fashion house Comme des Garçons,’ she says.